When an unhandled exception occurs, a dump file is written to the runtime temporary directory, TPTH if it is known, otherwise it is written to %TEMP%. There is only one dump file kept so each time an unhandled exception of the same name occurs, the dump file is overwritten. If there is not a user interface, for example a web job, then there may be very little feedback to the user interface that an unhandled exception has occurred. Either one or both of X_ERR.LOG or the Windows Event Viewer may contain details of the unhandled exception. Message : (0885) - Access violation (exception code c0000005) at address 06345604 should be reported to your product vendor as soon as possible by supplying the files X_ERR.LOG and X_DLL.DMP in directory c:\Temp\. 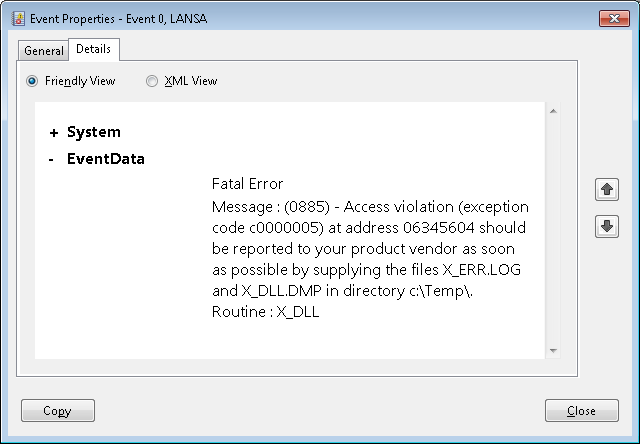 When you locate the dump file, C:\TEMP\X_DLL.DMP in this example, check that the date and time of the dump file match the timestamp in X_ERR.LOG or the Event Viewer. The time may not match exactly when a message has been displayed to the user, as the dump file is written out before the message is displayed. The x_err.log and the Event Viewer entries are written afterwards. The dump file will be critical to resolving your issue, so if there is a matching file ensure that it is sent to your LANSA supplier as part of the package of information. A dump file can be quite large,so it can be worthwhile compressing it before sending or uploading it to an ftp site. Note that in rare circumstances the dump file may be called LANSA_UNNAMED.DMP and it will be in %TEMP%, not TPTH.